At any given moment there is an auction going on or about to happen somewhere in Amish America. Amish auctions are social events, fundraisers, and a chance to buy goods at a decent price–and often all three rolled into one. Amish auctions are plugged in various ways–in local publications, Amish newspapers, flyers, word-of-mouth. If you’ve ever been to an Amish auction, you know the festive atmosphere, tantalizing food aromas, and electric cadence of the auctioneer’s call. It’s no wonder they are well-attended events. These were taken at a benefit auction in Arthur, Illinois for the annex schools in 2008. Annex schools were developed to provide an educational environment for those students who are unable to keep up with the rest of the class. It would be similar to a Special Education program within a public school context. In Arthur the annex schools share the same facility as the regular Amish school, they just sit in a separate area and have at least one dedicated teacher. Not every Amish school in Arthur has an annex school, but many do. To raise funds for the annex schools the community would host benefit auctions. These were suspended in 2009 as the community felt it was more appropriate to raise funds though the church districts rather than hosting a benefit auction. 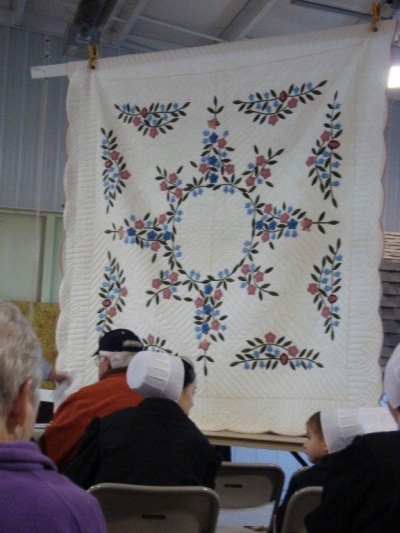 When I see an Amish-made quilt, I often think of how many man-hours (or, better put, “woman-hours”) went into making it. I’d imagine the stitches went faster knowing your handiwork was going for a good cause. Have you ever attended an Amish benefit auction? What was your experience like? 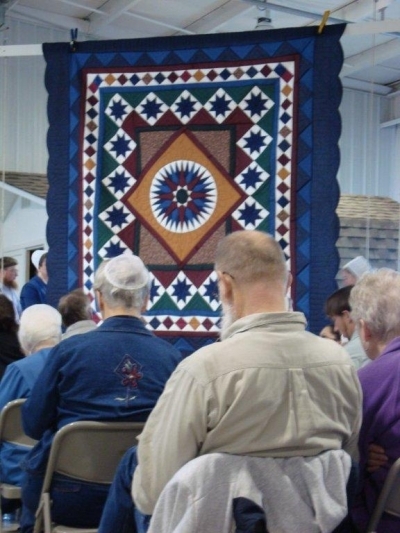 We attend the quilt auction in Cannelburg, IN every September on the Saturday before Labor Day. 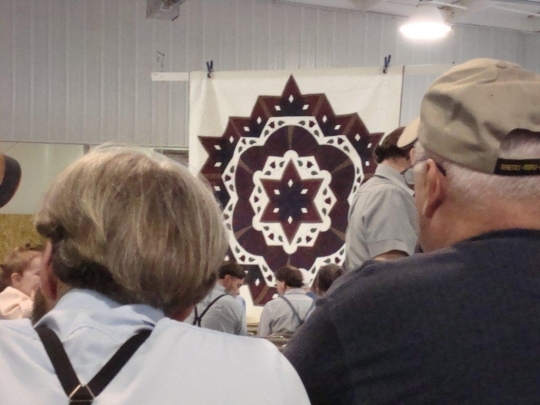 Being a quilter myself, I love seeing all the gorgeous quilts made by the Amish and Mennonite ladies of the community which are auctioned to support their schools. Out of curiosity, I kept a log of the hours I’m putting into the quilt I am currently making. Although I use an electric sewing machine to piece my quilts, the Amish use a treadle sewing machine to piece their quilts, which wouldn’t really make that much difference in time. I finished piecing the top last night and still have the borders to add, which will add another 1-1 1/2 hours. At this point, I have 91 hours involved in this king size quilt made in a rather easy pattern. 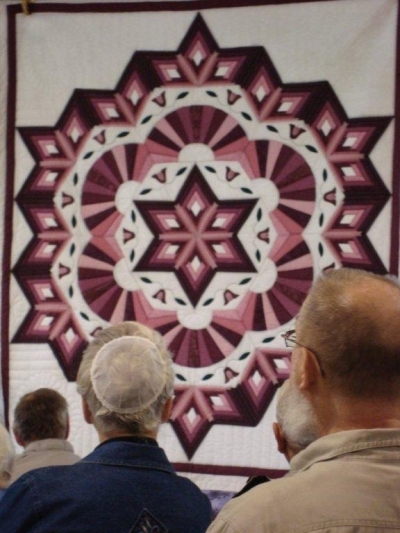 Where I will send my quilt out to someone who owns a long arm quilting machine to be quilted, the Amish would get together in a group or individually to hand quilt theirs, which would add many many more hours to the process before the quilt is finished. So, if you’re ever thinking handmade quilts are expensive at the $700 up to $2000 being charged for them, think again. At the average going salary of $8-$10 an hour for labor, you’re getting a bargain. Karen great point. If you really think about the labor and tedious work involved, some of those prices may even look a little low. You’re at the 90+ hour mark now–how many hours do you think this one quilt will total in the end, counting the equivalent in hand quilting? (I am assuming the outsource work your getting done will cut the time of that stage down considerably). 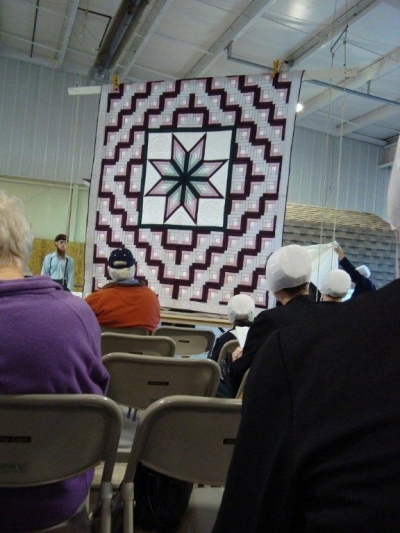 I have always wanted to go an Amish and Mennonite Quilt Auction in Penn Yan, New York, but I haven’t been there yet. For years it was the same weekend as our town Canal Town Days and I had to work there. This year, I finally took a break and said I am going to the quilt show-they held it the week before. I didn’t find out until I was all set to go. So I will try again next year. I probably couldn’t afford to buy one of the quilts-although I would really like to buy one, but I would have a good time looking at all the beautiful quilts and eating the food they sell. Several years ago I attended this auction in Arthur. This past summer I had the opportunity to talk with a lady in her quilt shop and she was telling me how they have different people who do different parts of the quilt — her selection of quilts in her shop was amazing. One of these day I WILL have one. With the quilt shops in places like Lancaster especially, some of the work is given out to other Amish women, even in other communities. Everyone specializes in something. For me that would make it more tedious (the same task, over and over and over), but probably more efficient–plus it spreads the work around, which is characteristic of a lot of Amish business. Three years ago my Husband and I (we are from Canada )attended an Auction in Lancaster in late June. It was the first one we have ever been at. It was fabulous, except it was approx 91 degrees out and very high humidity.They had a huge tent to sit in , if you could find a seat, but still the heat was unberable, so unfortunatly couldn’t stay too long. Last June we found one up here, called the school auction, it was great also. Looking forward to next years. What stunning quilts! Just as I thought I’d seen my “favorite,” I scrolled down to the next one and changed my mind! I’ve said it before, and I can’t help saying it again—any kind of hand-made textile (quilts, doilies, embroidery, hand sewing, etc.) “speaks” to me. I can almost hear the chatting, or the silent thoughts of each woman who produced the item. at the Hepton School Benefit Auction near Nappanee, Ind., on Nov.
auction (about 150 Amish and 5 non-Amish). enjoy watching and listening to the different auctioneer styles. The auctioneers were in their prime, joking with the crowd at times, making sure there was never a dull moment. above … the food is usually great and very reasonable. Speaking of auctioneering–you’ve hinted at a question I’ve always wanted to ask–about stamina and what it takes to get through a full event. I had assumed that since there is usually always a team, it must be pretty tiring–especially based on how energetically they “deliver the goods”. I wonder how long these guys can reasonably go before they start conking out or losing their voices. 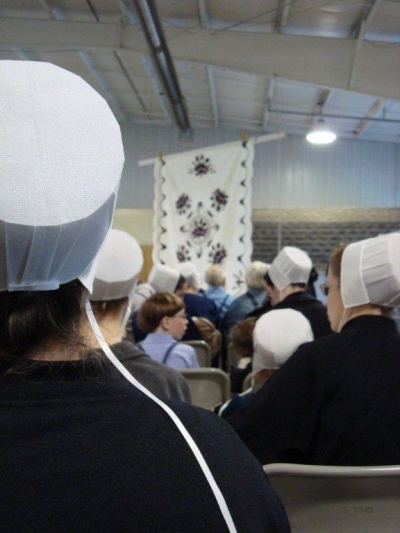 How does a person find out ahead of time when and where these Amish auctions will be held? Suzy, many of the larger better-known ones are published well in advance. These include the “Mud Sales” in Lancaster County, or auctions held at dedicated auction houses in Amish communities (Mount Hope in Holmes Co, OH, Dinky’s in Daviess Co, IN). The smaller sales and schoolhouse auctions are apt to be publicized locally. Also Amish publications like the Budget or Plain Communities Business Exchange should have this type of info.